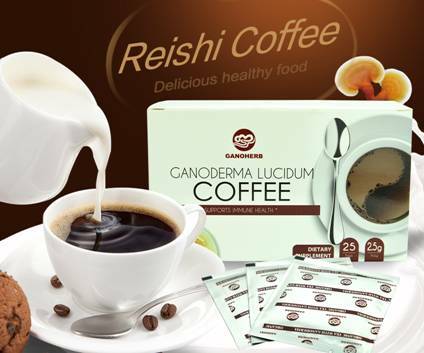 Ganoderma Coffee (Reishi Mushroom Coffee/Lingzhi coffee) perfectly combines the tasty Arabica black coffee and the essence of Ganoderma Lucidum together, delivering the best product to boost your morning with some extra health benefits. 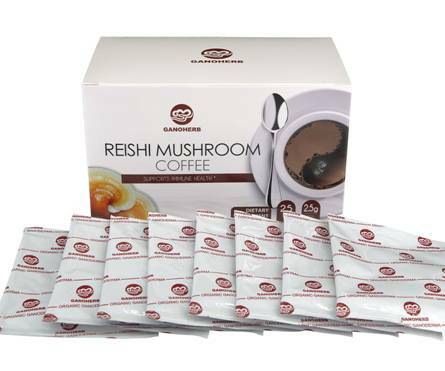 The organic Ganoderma ingredient of this product comes from our self-built organic Ganoderma farm located at pristine Mt. Wuyi, one of the largest Ganoderma origins in China. GanoHerb has acquired 4 organic certificates from China, the US, Japan, and the EU. We do not use any chemical fertilizer, herbicide, or pesticide to ensure that not any chemical contaminants will be left in the products. This Reishi black coffee tastes just like a good black coffee, without any mushroom taste whatsoever. It has a mellow taste with slight bitterness and a nutty and chocolaty aroma. It is perfect for pairing with snacks such as cookies and cakes. You can also add sugar and creamer depending on your own preference. Ganoderma instant coffee is also very easy to make. Each box has 25 sachets. Simply add hot water to the coffee mix and stir thoroughly, a cup of delicious Ganoderma black coffee will be ready for you in seconds. Not only does the Ganoderma black coffee taste delicious, it is also good for your health. Ganoderma has been proven to be effective in enhancing overall immunity, protecting the liver, improving sleep quality and relieving stress. It is gluten-free, lactose-free, and no additives or preservatives whatsoever, therefore it is suitable for all people especially for people with low immunity or high stress.